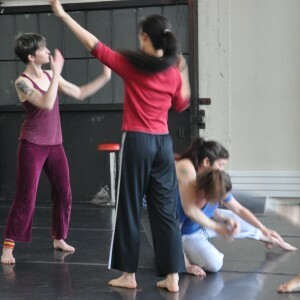 Contemporary San Francisco dance artist Christy Funsch hosted a special kind of open rehearsal on Saturday, March 7: a Dance Wrecking, in which her colleagues Rowena Richie, Megan Nicely and Keith Hennessy dismantled her work and re-created in their own ways. A courageous move by Funsch, and a fascinating window into contemporary dance making for the rest of us. I explored the experience for DanceTabs. Courtney Moreno, Peiling Kao, Erin Mei-Ling Stuart and Aura Fischbeck in Christy Funsch’s “Dissolver.” Photo by Christy Funsch.